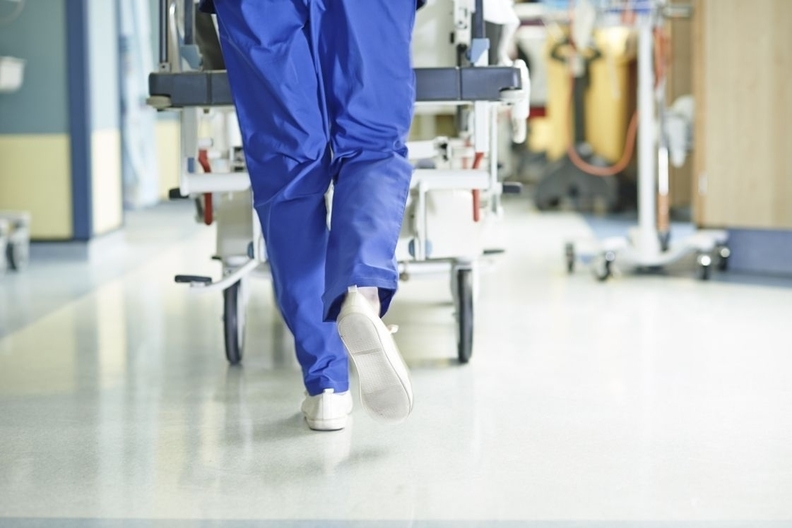 The majority of urban hospitals don't perform well on patient safety measures, according to the latest Hospital Safety Grade report released Tuesday by the Leapfrog Group. Of the 11 hospitals in New York City included in the report, only one—NYC Health & Hospitals/Metropolitan—received an "A" grade from the Leapfrog Group in its spring 2018 report. Additionally, just three of Los Angeles' 12 hospitals got an "A" while only six of Chicago's 18 hospitals did. Even though hospitals in large cities treat patients with an array of social risk factors, the location of a hospital is no excuse for poor performance on safety, said Leah Binder, CEO of the Leapfrog Group. "Patient safety doesn't depend on the patient population." All hospitals can—and should— provide safe care, but some still haven't made the strategic commitment it requires, she said. Patient safety has to be the focus of the entire organization, from leadership to front-line staff, to improve performance, she added. "It's an overhaul of the way you function as an organization," Binder said. Leapfrog's most recent report shows change is possible, noting that there are five hospitals with A's for the first time when they previously scored an "F."
Leapfrog, which has released hospital safety grades every April and October since 2012, advocates for improved transparency in healthcare. They hope patients will use the safety grades when they choose hospitals. But there are discrepancies the public needs to consider. Some of the hospitals that received low grades from Leapfrog have been recognized for strong quality performance by other organizations. For example, Cedars-Sinai Medical Center in Los Angeles and Mount Sinai Hospital in New York both received "C" grades from Leapfrog even though they were recently recognized by U.S. News and World Report as "Best Hospitals." The discrepancies point to a frequent expert criticism of rankings and lists. With so many different quality rankings, it's difficult for patients to decide which sites they should rely on. Hospitals have also questioned the validity of the methodology Leapfrog uses. Cedars-Sinai said in a statement that it doesn't participate in Leapfrog's hospital survey because it doesn't support the method. The hospital claimed it was penalized with a low grade as a result. "A more reliable and accurate measure of Cedars-Sinai's quality can be found through reputable sources such as CMS's Hospital Compare," a spokeswoman said. Similar to its fall report, Leapfrog's latest analysis shows wide variation in patient safety performance across hospitals. 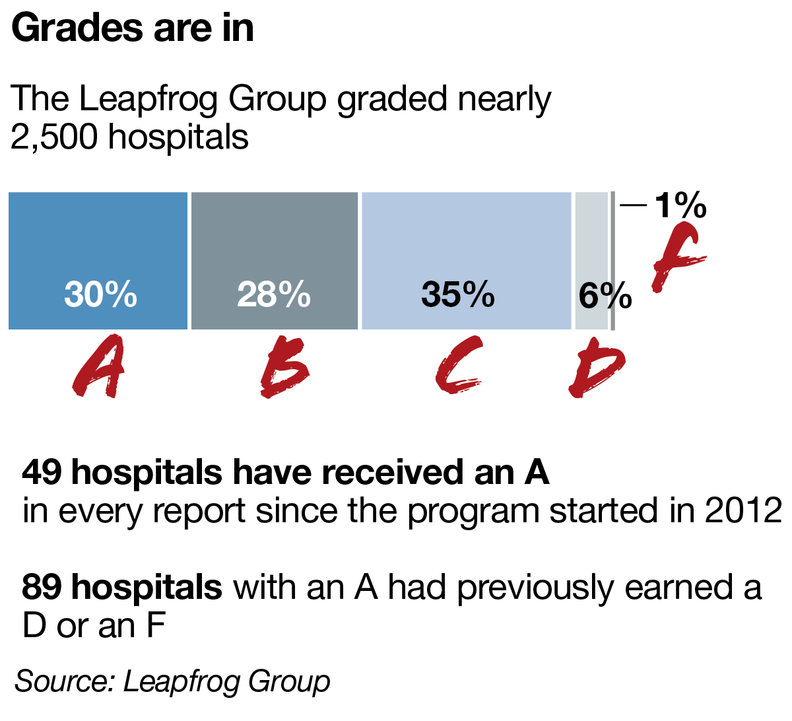 Leapfrog graded 2,479 hospitals this spring, of which 750 earned A's, 683 scored B's, 879 received C's, 145 got D's, and 22 were given F's. Hospitals nationwide can tackle persistent patient safety issues by considering them more in value-based purchasing programs, Binder said. "A lot of the value movement has been aimed at quality outcomes and pricing, and they have overlooked the third leg of the stool, which is safety," she said. Leapfrog is working with the CMS to integrate patient safety measures into value-based purchasing programs so hospitals will have additional incentives to focus on patient safety. Leapfrog calculates the grades using 27 measures, including hand hygiene, falls and pressure ulcers. The data are derived from the CMS, Leapfrog's own hospital survey, and secondary data sources such as the American Hospital Association. Leapfrog also announced Tuesday that it's taking public comments on two proposed changes to its methodology. The not-for-profit has suggested lowering the number of points hospitals will earn for the computerized physician order-entry measure if the data are derived from the AHA, which it considers a secondary source that offers less detail than if the information is from the Leapfrog hospital survey. Leapfrog has also proposed adding a bar-code medication administration measure. Most hospitals have a process in place where a clinician scans the bar code on a medication and the patient's identification badge to ensure the patient is getting the correct medicine. While this should be done at a patient's bedside, that doesn't always happen, Binder said. The Leapfrog survey would ask hospitals if they have a process to ensure bar code medication administration is done in front of the patient. Binder said medication administration errors are the most frequent patient safety mistakes in hospitals, but they are difficult to track and monitor. The proposed changes—if approved—would be implemented in the next Hospital Safety Grade report in fall 2018. An edited version of this story can also be found in Modern Healthcare's April 30 print edition.